Nearly 1,000 Mon State residents signed a petition asking the Karen National Union to cancel a quarry and a cement factory slated for construction in an environmentally sensitive mountain pass. The residents of Thaton township said the Min Lwin Mountain is sacred to the locals, and the planned projects could led to deforestation, extinction of wildlife, land disputes and pollution. Phyu Min Tun Company Limited started mineral tests in 2014 as a preliminary measure before building. The KNU suspended the project in May 2016 in response to protests and complaints lodged by the Min Lwin Area Natural Environment Protection Committee. The committee gathered over 900 signatures on its latest appeal, which was sent to the KNU on May 27. The petition calls for the KNU to formally announce a permanent end to the projects. The letter was addressed to the chair of the KNU’s Thaton township office, with copies also submitted to the KNU central office, and officials from Thaton District, Thaton township and Maung Lay Village Group, according to the Min Lwin Area Natural Environment Protection Committee’s vice chair, Naw Than Sein. 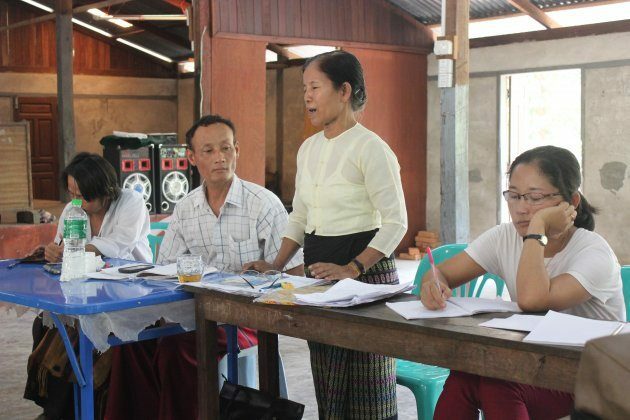 “Although the KNU said the Min Lwin Mountain [project] has been suspended, they are still coming to meet with the local residents to discuss the project, so we submitted this letter. We don’t want them to make any more demands for carrying out this project. We have told them several times not to carry it out,” she said. According to the letter, the KNU has previously promised not to carry out any projects that could harm the public, or that are not approved by the public, in line with the economic policy set down by the 16th KNU Conference. The KNU Thaton District’s chair most recently discussed the planned Min Lwin Mountain cement factory during an April 29 meeting with local residents. The locals reiterated their disapproval of the project at the meeting.